Learn how to identify and break from partners who are harmful to your personal well-being. Toxic Men: 10 Ways to Identify, Deal with, and Heal from the Men Who Make Your Life Miserable by Dr. Lillian Glass, world-renowned body language and communication expert offers insights into unhealthy relationships. 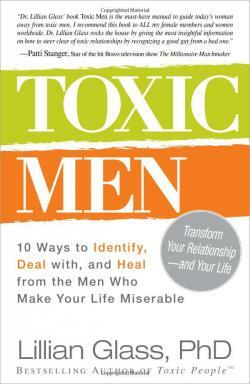 "Men who have read this book say they applied the information to their relationships they had with a toxic woman," said Dr. Glass. "It is also helpful to men who will now know what women find toxic in a relationship." The book notes 11 types of toxic men. Dr. Glass said that sometimes it can "take a lifetime" to recognize a toxic man and recognizing red flags is important. "Women who are fixers or caretakers often tend to be easy prey for toxic men," said Dr. Glass. Women in careers that help people change are also potentially susceptible to these men. This includes teachers, mothers, homemakers, office assistants, nurses and psychologists and therapists. Dr. Glass says that a major sign of a toxic man is that the woman isn't happy. The women will not feel well physically, mentally or, emotionally. "A toxic man brings out the worst in her," said Dr. Glass, "not the best." The moniker or name the person chooses, because it may give you an idea of who he is, his interests and his intentions. Determining whether a woman stays or leaves a relationship depends on a number of variables. "While it is difficult, if not impossible, to change a person, you can change your perception and your own behavior, which can often bring about changes in the toxic man's behavior," said Dr. Glass. Men can go from being the best partner at the start of a relationship or marriage to the worst. As Dr. Glass pointed out, "As pressures in life occur or as daily life changes, he may let his guard down and may show you personality traits or behaviors that are toxic to you. If a man continues with these behaviors that don't make you feel good about yourself, this may be who he has become -- toxic to you." "What is acceptable in one culture may be considered toxic by another culture, so make sure you understand all of the cultural expectations and morals before you get involved with a man from another background," said Dr. Glass. What's acceptable in Western cultures may not be okay in another country. Dr Glass said, "There are certain cultures where women cannot speak freely in public or in private for that matter. That society may dictate that a husband's word is the final word and there is no compromise. In other cultures, if a woman wants a divorce, the man gets the children. Therefore, know what you are getting into beforehand so there will be no surprises." Women can stop dating toxic men once they have learned how to identify them and deal with them. Use the book's exercise to "detect which type of man is specifically toxic to you" and note the patterns in your past relationships. These are the people who will be toxic to you. Once you find the pattern and understand the toxic personality, you'll have taken the "first step towards breaking the pattern," according to Dr. Glass. Finding "bad boys" isn't recommended, no matter how much you may be initially attracted to him. Dr. Glass said, "If you enjoy the ups and downs of high drama, see it in a film or take an acting class. Don't live it out in real life. The consequences aren't worth it." She pointed out that there is "nothing you can do to change a bad boy."